Egg: Laid in rotting vegetation or animal waste. Hatch between 8hours to 2 days. Larvae: Grow to a size of 12mm, take up to 3 moults and on average reach their pupal stage within a week. Adult: Adults are 6mm with a greyish striped thorax with a pale yellow thorax. Can live for several weeks dependant on food availability and temperature. The larvae are 12mm, whitish and legless, usually living in a semi liquid food medium. They will migrate away from the food to find a warm, dry location to pupate in a reddish brown pupal case which darkens in hue as it develops. When the adults emerge they are 6mm long with a greyish stripped thorax and yellowish abdomen. The wings of the adult fly are slightly spread when at rest. 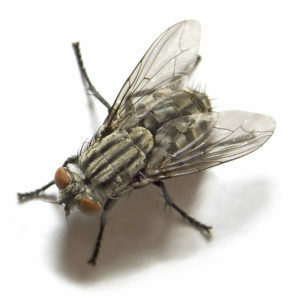 The housefly is found worldwide, but in the UK is most commonly associated with any sites which have a lot of decaying organic matter. Larvae tend to produce ammonia when they moult giving harbourage a distinct and unpleasant smell. Adults can be seen flying through the air. 1. The British Pest Management Manual. Section 5, pg 155. 3. BPCA Manual, Chapter 6.